The impact and intent, as outlined in the announcement, are straightforward. 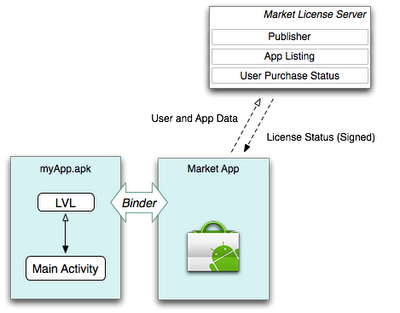 If you want to enable your app to use the licensing server, there’s no substitute for reading the authoritative documentation: Licensing Your Applications. Here are some technical highlights. This capability has been in the Android Market client app since 1.5, so you don’t have to be running the latest Android flavor to use it. It’s secure, based on a public/private key pair. Your requests to the server are signed with the public key and the responses from the server with the private key. There’s one key pair per publisher account. Your app doesn’t talk directly to the licensing server; it IPCs to the Android Market client, which in turn takes care of talking to the server. There’s a substantial tool-set that will ship with the SDK, the License Verification Library (LVL). It provides straightforward entry points for querying the server and handling results. Also, it includes modules that you can use to implement certain licensing policies that we expect to be popular. LVL is provided in source form as an Android Library project. It also comes with a testing framework. There’s a Web UI on the publisher-facing part of the Market’s Web site for key management; it includes setup for production and testing. Obviously, you can’t call out to the server when the device is off-network. In this situation you have to decide what to do; one option is to cache licensing status, and LVL includes prebuilt modules to support that. We think this is a major improvement over the copy-protection option we’ve offered up to this point, and look forward to feedback from developers. We’ve just announced the introduction of a licensing server for Android Market. This should address one of the concerns we’ve heard repeatedly from the Android developer community. The underlying problem has been corrected and following data repair, the reported statistics should now be accurate. Our apologies for the glitch. 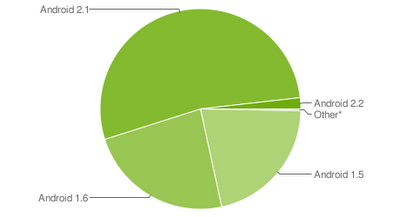 On July 1, 2010 this was the breakdown of active devices running different versions of the Android platform. With all of the new platform features added to the Android SDK in each version, this chart has many developers shouting the F-word when they are forced to choose between integrating newer platform features and providing their app to the widest possible audience. Savvy Android developers already know that these two options aren’t really mutually exclusive, but that straddling between them can be painful. In this post I’m going to show you that it doesn’t have to be that way. Several weeks ago we took a look at how to handle multitouch on Android 2.0 (Eclair) and above, and by the end we had a simple demo app. That app uses features exclusive to Android 2.2 (Froyo) which as of this writing hasn’t had a chance to reach many devices yet. 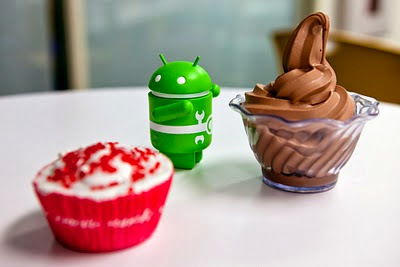 In this post we’re going to refactor that demo to run on devices all the way back to Android 1.5 (Cupcake). If you’d like to follow along, start off by grabbing the code in the trunk of the android-touchexample project on Google Code. We broke the contract of minSdkVersion, and here is the result. When we build our app against SDK 8 (Froyo) but declare minSdkVersion="3" (Cupcake) we promise the system that we know what we’re doing and we won’t try to access anything that doesn’t exist. If we mess this up, we see the above, and our users see an ugly error message. Cue a lot of frustrated users and one-star ratings on Market. We need a safe way of accessing newer platform functionality without making the verifier angry on older platform versions. Many Android developers are already familiar with the practice of accomplishing this through reflection. Reflection lets your code interface with the runtime, detect when certain methods or classes are present, and invoke or instantiate them without touching them directly. The prospect of querying each platform feature individually and conditionally invoking it using reflection isn’t pretty. It’s ugly. It’s slow. It’s cumbersome. Most of all, heavy use can turn your app’s codebase into an unmaintainable mess. What if I said there is a way to write Android apps that target Android 1.5 (Cupcake) through 2.2 (Froyo) and beyond with a single codebase and no reflection at all? There is a very important guaranteed behavior at work here explained by the comment above SingletonHolder. Java classes are loaded and initialized on first access - instantiating the class or accessing one of its static fields or methods for the first time. This is relevant to us because classes are verified by the VM when they are loaded, not before. We now have everything we need to write Android apps that span versions without reflection. As it turns out this is fairly simple to apply. You generally will want your app to degrade gracefully on older platform versions, dropping features or providing alternate functionality when the platform support isn’t available. Since Android platform features are tied to the API level you have only one axis to consider when designing for compatibility. In most cases this version support can be expressed as a simple class hierarchy. You can design your app to access version-sensitive functionality through a version-independent interface or abstract class. Subclasses of that interface intended to run on newer platform versions will support newer platform features, and subclasses intended for older versions might need to present alternate ways for your users to access app functionality. Your app can use a factory method, abstract factory, or other object creation pattern to instantiate the proper subclass at runtime based on the information exposed by android.os.Build.VERSION. This last step insures that the system will never attempt to load a class it can’t verify, preserving compatibility. At the beginning of this post I said that we are going to refactor the touch example app from Making Sense of Multitouch to be compatible from API level 3 (Cupcake) on through API level 8 (Froyo). In that post I pointed out that GestureDetectors can be a useful pattern for abstracting the processing of touch events. At the time I didn’t realize how soon that statement would be put to the test. We can refactor the version-specific elements of the demo app’s touch handling into an abstract GestureDetector. 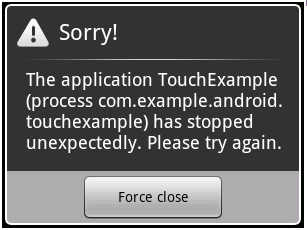 Our TouchExampleView class isn’t compatible with Android versions prior to Froyo thanks to its use of ScaleGestureDetector, and it isn’t compatible with versions prior to Eclair thanks to its use of the newer MotionEvent methods that return multitouch data. We need to abstract that functionality out into classes that will not be loaded on versions of the platform that don’t support it. To do this, we will create the abstract class VersionedGestureDetector. 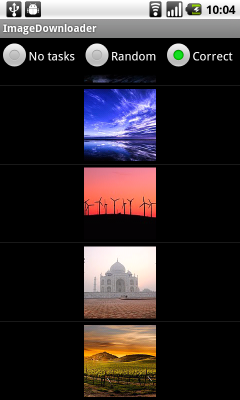 The example app allows the user to perform two gestures, drag and scale. VersionedGestureDetector will therefore publish two events to an attached listener, onDrag and onScale. TouchExampleView will obtain a VersionedGestureDetector instance appropriate to the platform version, filter incoming touch events through it, and respond to the resulting onDrag and onScale events accordingly. We’ll start with the simplest functionality first, the VersionedGestureDetector for Cupcake. For simplicity’s sake in this example we will implement each version as a private static inner class of VersionedGestureDetector. You can organize this however you please, of course, as long as you use the lazy loading technique shown above or some equivalent. Don’t touch any class that directly accesses functionality not supported by your platform version. This simple implementation dispatches onDrag events whenever a pointer is dragged across the touchscreen. The values it passes are the X and Y distances traveled by the pointer. EclairDetector calls super.onTouchEvent after determining the active pointer index and lets CupcakeDetector take care of dispatching the drag event. Supporting multiple platform versions doesn’t have to mean code duplication. Finally, let’s add scale gesture support for Froyo devices that have ScaleGestureDetector. We’ll need a couple more changes to CupcakeDetector first; we don’t want to drag normally while scaling. Some devices have touchscreens that don’t deal well with it, and we would want to handle it differently on devices that do anyway. We’ll add a shouldDrag method to CupcakeDetector that we’ll check before dispatching onDrag events. Since we’re targeting Cupcake, we don’t have access to Build.VERSION.SDK_INT yet. We have to parse the now-deprecated Build.VERSION.SDK instead. But why is accessing Build.VERSION_CODES.ECLAIR and Build.VERSION_CODES.FROYO safe? As primitive static final int constants, these are inlined by the compiler at build time. The ClassLoader loads classes lazily and will only load and verify classes on first access. Factor out app functionality that can differ between platform versions with a version-independent interface or abstract class. Instantiate a version-dependent implementation of it based on the platform version detected at runtime. This keeps the ClassLoader from ever touching a class that it will not be able to verify. To see the final cross-version touch example app, check out the “cupcake” branch of the android-touchexample project on Google Code. In this example we didn’t provide another way for pre-Froyo users to zoom since ScaleGestureDetector was only added as a public API for 2.2. For a real app we would want to offer some alternate affordance to users. Traditionally Android offers a set of small tappable zoom buttons along the bottom of the screen. The ZoomControls and ZoomButtonsController classes in the framework can help you present these controls to the user in a standard way. Implementing this is left as an exercise for the reader. Android 2.2 supports application installation on external storage devices like the SD card. This should give users room for many more apps, and will also benefit certain categories, like games, that need huge assets. The “Manage Applications” screen in the Settings app now has an “On SD Card” tab. The sizes listed in Manage Applications only include the space taken by the application on internal storage. The Application Info screen now has either a “move to SD card” or “move to phone” button, but this is often disabled. Copy-protected apps and updates to system apps can’t be moved to the SD card, nor can those which are don’t specify that they work on the SD card. SD-card installation is an optional feature on Android 2.2, is under the control of the developer not the user, and will not affect any applications built prior to Android 2.2.
internalOnly: Install the application on internal storage only. This will result in storage errors if the device runs low on internal storage. preferExternal: The android system tries to install the application on external storage. If that is full, the application is installed on internal storage. auto: Let the Android system decide the best install location for the application. The default system policy is to install the application on internal storage first. If the system is running low on storage, the application is then installed on external storage. 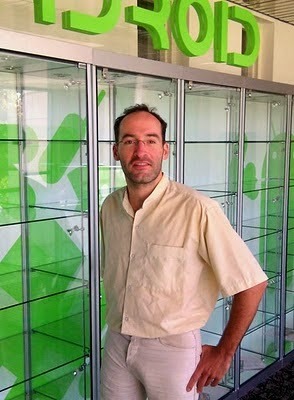 If the installLocation is not specified (as is the case for all applications prior to Android 2.2), the application is installed on internal storage. Application updates will by default try to retain their install location, but application developers may change the installLocation field in an update. Installing an application with this new attribute on older devices will not break compatibility and these applications will be installed on internal storage only. Note that changing this default can cause applications to misbehave if they’re not prepared to live on the SD card. The Android system stores the SD-card-resident applications’ APKs in a secure application-specific container. A new flag FLAG_EXTERNAL_STORAGE in ApplicationInfo object indicates that an application is currently installed on the SD card. This storage is removed when an SD-card-resident app is uninstalled. When an Android device’s SD card is unmounted, applications installed on it are no longer available. Their internal storage is still there and such apps can be uninstalled without replacing the SD card. When the SD card is unmounted, ACTION_EXTERNAL_APPLICATIONS_UNAVAILABLE with a list of the disabled applications and a list of corresponding application uid’s via extra attributes in the broadcast intent. When the SD card is mounted, ACTION_EXTERNAL_APPLICATIONS_AVAILABLE with a list of enabled applications and a list of corresponding application uid’s via extra attributes in the broadcast intent. Applications that handle broadcast intents like ACTION_PACKAGE_ADDED, ACTION_PACKAGE_REMOVED may also want to handle these additional notifications. When an application gets moved between internal to external storage and vice versa, the application is disabled first (which includes broadcasting intent ACTION_EXTERNAL_APPLICATIONS_UNAVAILABLE), the asset resources are copied, and then the application is enabled (which includes broadcasting intent ACTION_EXTERNAL_APPLICATIONS_AVAILABLE). Applications on SD card are mounted via Linux’s loopback interface and encrypted via a device-specific key, so they cannot be decrypted on any other device. Note that this is security measure and does not provide copy protection; the apps are world readable just like the resources of normal applications installed on the device’s internal storage. Copy-protected applications cannot be installed on external media. In the interests of stability, updates to system applications also cannot be installed on the external media. The application resources stored on external storage are read-only and hence there are no performance issues with loading or launching applications on SD card. It has always been the case that when you swap SD cards on an Android device, if you physically copy the contents of the old card to the new one, the system will use the data on the new card as if nothing had changed. This is also true of apps which have been installed on the SD card. When not to install on SD card? The advantage of installing on SD card is easy to understand: contention for storage space is reduced. There are costs, the most obvious being that your app is disabled when the SD card is either removed or in USB Mass Storage mode; this includes running Services, not just interactive Activities. Aside from this, device removal disables an application’s Widgets, Input methods, Account Managers, Device administrators, Live wallpapers, and Live folders, and may require explicit user action to re-enable them. There are a bunch of mobile and Android-related sessions, both pure and extremely impure; for example, I bet both Steve Jobs and I are dubious about Cross-Compiling Android Applications to the iPhone. There's a full-dress Android for Java Developers tutorial. And (the one I helped cook up) there's the Android Hands-On; last I heard, registration for that is approaching 200 and, since O'Reilly found us a big room, it's not full up; but it will be. On top of which, there are going to be a herd of Googlers at OSCON, and a sub-herd of Androiders, including Dan Morrill and Justin Mattson and me. This isn't surprising; what does surprise me is that OSCON hasn't previously been an Android love-fest. Because if you're interested in mobile devices and have a hankering for Open Source, Android is for you. Android developers who aren't already going should take a moment to check out the OSCON 2010 schedule, and give serious thought to a trip to Portland in a couple of weeks. OSCON is one of the world's premiere events for those who care about Open Source, and one of my personal favorite conferences, with a powerful community vibe. And this year, the Android drums are sounding.